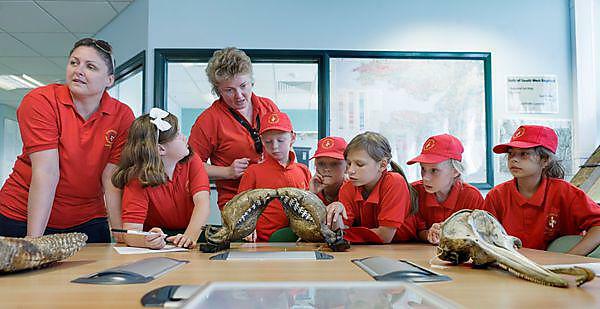 A dozen children from the Ukrainian city of Chernobyl have made their annual visit to Plymouth University. The trip to the city-centre campus was part of the month-long visit arranged by the Plymouth & District link of the Chernobyl Children’s Life Line, which works to bring child victims of the Chernobyl nuclear disaster to the UK for recuperative breaks of four weeks. It is the sixth year that the children have visited the University, and again a packed programme of events was held in their honour. They were taken to the Immersive Vision Theatre, the University's panoramic-screen facility, and then introduced to many of its robots in the School of Computing and Mathematics. And then after studying dinosaur footprints and getting hands-on with the ship simulator in the Marine Building, the children visited the LABplus facility in the Davy Building - an open access laboratory designed for students to enhance their practical field and laboratory skills.